Courtesy of Century 21 Arizona West. Perfect time to purchase a getaway!!! Buyer come finish this home and put your special touches on it. This is a hidden jewel!. .61 acres of flat, usable land. Priced to sell. 20×8 Storage shed with 20×8 covered carport with metal roof. Property is fenced with chain link fencing. 2 double gates for your RV. Currently home is being built and has the subfloor in. 4 ft crawl space underneath.Building plans have been approved, permitted and will be given to the buyer. Home will be approx. 579 sq ft with a porch to relax under. Septic has permit. Leach lines are in. Mature trees on property. Don’t miss out on this great buy!!! Directions: From Hwy 89, West on Lakewood, follow to property on the right. Approximate size: 26572.00 sq. ft. Please, send me more information on this property: MLS# 5838376 – $55,000 – 23075 S Lakewood Drive, Yarnell, AZ 85362. 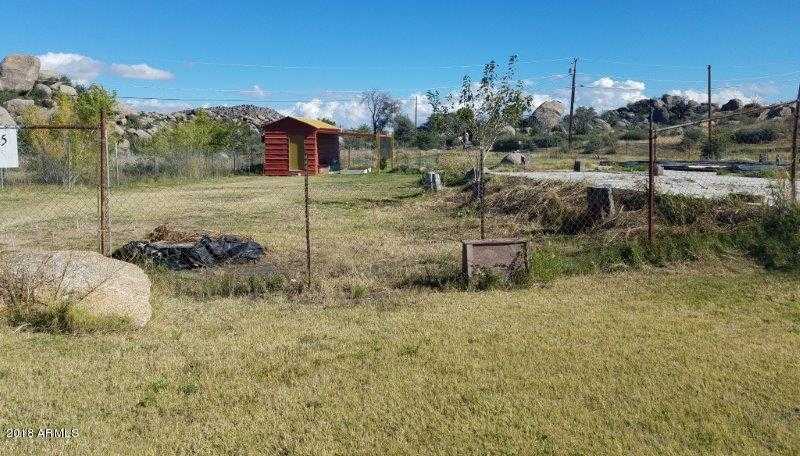 I would like to schedule a private showing for this property: MLS# 5838376 – $55,000 – 23075 S Lakewood Drive, Yarnell, AZ 85362.